There’s a porous boundary between collecting and hoarding. I see I wasn’t paying attention when I crossed over it. Way over it. 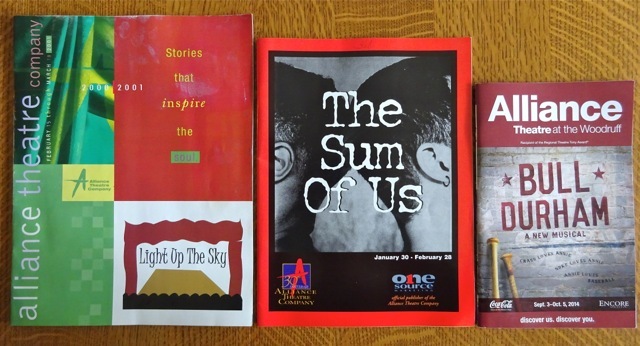 These are Theater Programs — just a small portion of the ones I, um, collected. This stack is bigger than it looks. I counted 77 to discard, and I’m only a little way through the “collection”. I can’t think of anything else to do with them but recycle. I don’t think there’s a museum of theater programs to donate to, although a little conscious googling reveals that MoMA has a collection of Parisian Avant-Garde theater programs (here’s a link). Too bad mine don’t fit that category. Theater Programs are shrinking, but, that’s a good thing. 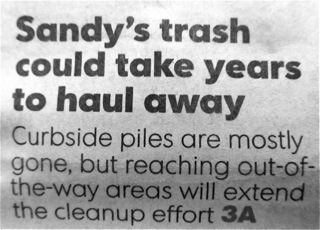 There’ll be less waste. In the beginning, I collected programs so I’d remember which actors I’d seen in London or New York. I kept that interest over the years through subscriptions to Missouri Repertory Theater in Kansas City, the Alliance in Atlanta, and trips to the Shaw Festival in Ontario. 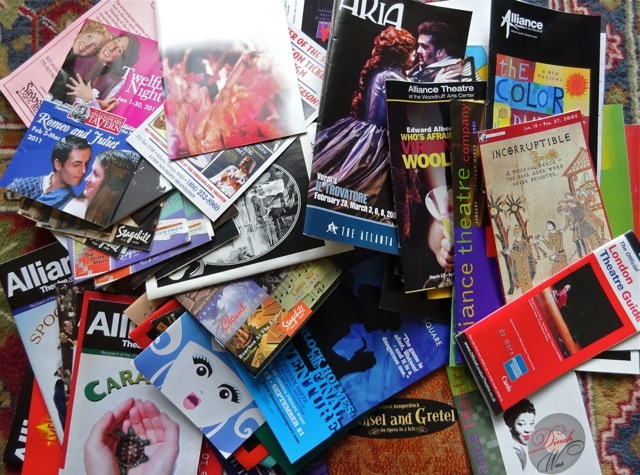 Now, looking back through the programs, I realize I’ve seen so many productions over the years that there are many I’ve forgotten. Some theaters encourage us to leave our programs there for the next audience, and I realize that anything else is wasteful. I wonder how long it will be before we can download them or view them on our phones while in the lobby? The Met Opera already e-mails program notes before its cinema simulcasts, so I expect help is on the way. Can anyone think of a good use for old theater programs? Scrapbooking? Or I think collages? That way you get to condense and keep the main parts? Good luck! And good for you! Aaaah. Program booklets. That’s quite a collection you have. Some of them can be really fancy with thick paper and lots of colour. I used to frequent watching the Melbourne Symphony Orchestra a few times a year a few years back. I certainly grabbed the program guide and it would tell me about the history of the pieces and the guests musicians. And of course, the conductor. I decided to send them all to recycling the other day. Sometimes I think, “Why did I go to see that performance in the first place?” while flipping through the old program booklets. Then the price of each ticket comes back to me and if I hadn’t gone to so many, I would easily have a few thousand dollars more in my pocket. But yes, seeing performers right before your eyes is a sight to behold. Nothing like live talent. However, being the short person that I am, unless I am in the front row there us always bound to be someone blocking my view…which is why I generally splurge on music tickets. As a fellow short person, I always get the side aisle when possible. It works in movie theaters too. Inevitably, if there’s someone with a big hair style or a large hat, or someone who can’t help being 7 feet tall — that person has the seat in front of ME. I hadn’t thought of the music solution. Good one! “to support people in the arts.” Certainly a good reason to go to theater or orchestra. The more we see, the more we discover what kinds of art genre floats our boat and what we connect to. Side aisle seats are certainly the way to go. A few months ago I went to a music concert and got an aisle seat somewhere in the middle. Not ideal since someone tall sat in front of me. Had it been the aisle to my right, I would have been able to shift slanted in my seat and see the show in full view. Some theaters have the seats staggered so that it’s possible to see between people in front of you — (unless the hair or hat is really wide, and I have been behind some of those. I wish more theaters realized it’s needed. Stadium seats in the newer cinemas are wonderful in that regard. Maybe we’ll have to switch to movies. Of the auditoriums I’ve been to, generally the seats right in front of the stage or the “stalls” section is flat, and as it goes back staggered and so are seats in the upper levels. Still, it’s always hard for me to see unless I’m like five rows from the front. Comes to think of it, I’ve never had trouble seeing the screen in cinemas. Perhaps the seats here tend to be staggered much more. Those seats in the very front can make it easier to see because everyone is looking up. But it always gives me a crick in the neck, so back is better. But in London, for example, they used to sell the seats in the 1st 2 rows on the morning of the performance, and they were less expensive — so tempting. Sounds like you have better cinema seats (here, it can be a problem seeing subtitles, which usually just happen in the older cinemas anyway, since the big ones just get blockbusters, not films in other languages) I sound like a person who is overly entertained!